This invention relates to antenna systems and particularly to flexible transmitting dipole antenna systems. As is known, half-wave dipoles termed herein "conventional dipoles" and comprising two go-linear wires, and rugged vertical half-wave "coaxial dipoles" of the type disclosed in Patent 2Д84,729 to A, B. Bailey, are employed in the high frequency and very high frequency fields for transmitting a large amount of power. In general, these relatively heavy transmitting half-wave dipoles and associated transmission lines require rigid supporting structure and are usually attached, at the dipole mid-point, to the supporting structure. Ordinarily, the band widths of these prior art rigid transmitting dipoles are relatively narrow and therefore not entirely satisfactory. Accordingly, it now appears desirable and advantageous to obtain a flexible high power transmitting dipole having a relatively wide baud width characteristic. It is one object of this invention to obtain a flexible transmitting dipole antenna having a broad band width. It is another object of this invention to secure a portable, easily supported or suspended, iiigh power dipole of simple construction. It is still another object of this invention to secure a high power transmitting dipole antenna whiGh does not require support at its mid-point. 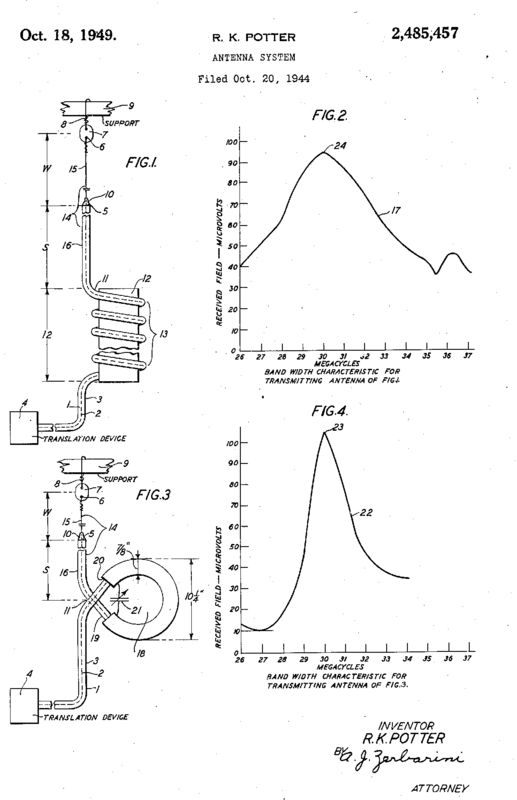 In accordance with one embodiment of the invention a high power transmitting dipole comprises a vertical coaxial line having an inner conductor extending above and beyond the outer conductor a distance of approximately a quarter wavelength. At a point about a quarter wavelength from the end of the outer conductor the line is coiled to form an impedance. The coil functions to resonate the half-wave coaxial line section above the coil, that is, to secure dipole action, and to prevent the flow of spurious currents on the outer surface of the remaining outer conductor portion below the coil. The uppermost extremity of the inner conductor is attached through an insulator to a support. While the dipole antenna is especially suitable for transmitting radio waves it may, of course, be used for radio reception. Fig. 3 is an elevational view of a different embodiment of the invention, and Fig. 4 illustrates 5 the band width characteristic for the embodiment of Fig. 3. Referring to Fig. 1, reference numeral I denotes a coaxial line comprising an inner conductor 2 and an outer conductor 3. The line 1 is connected at its near end to a translation device 4, such as a very high frequency transmitter; and the portion of the line adjacent the remote end is vertically positioned. The inner conductor 2 extends above and beyond the extremity 5 of the outer conductor 3 a distance W approximately equal to a quarter wavelength at the means or design operating frequency. The extremity 6 of the inner conductor 2 is secured through insulator 7 and guy wire 8 to the supporting member 3; and the outer conductor 3 is supported at its extremity 5 by insulator 10 and the inner conductor 2. At a point 11, located at a distance S approximately a quarter wavelength below the extremity 5, the line i is bent or coiled about the tubular insulator 12 so as to form a multiple turn impedance coil <3. As explained below, the section 14 of line I extending above point JI and comprising the exposed inner conductor section or "whip" (o and the outer conductor section or "skirt" 16 functions as a dipole antenna over a broad frequency range. In operation, waves of a given frequency are supplied by the high power transmitter 4 over the lower portion of line I and coil 13 to the upper line portion 14 and thence radiated. The coil i 3 causes the upper line portion to resonate at the operating frequency and therefore to function as a dipole. As is the case of an ordinary vertical dipole, the directive pattern is substantially non-directional in the horizontal plane and somewhat directional in the vertical plane, the direction of maximum action in the vertical plane being horizontal.. The coil 43, or more accurately, the coiled portion of the outer conductor 3, functions as a high impedance whereby the flow of spurious currents along the outer surface of the center conductor 3 is prevented. In a system actually constructed in accordance with Fig. 1, the lengths W and S of the whip and skirt elements 15 and 16 were 90.5 and 82.5 inches, respectively. 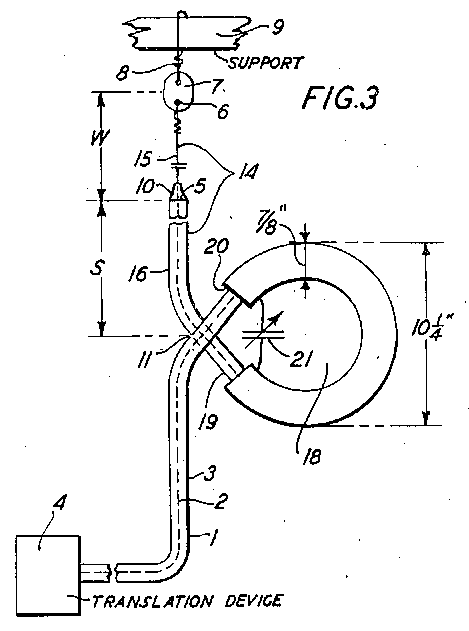 A tubular insulator 12 having a diameter of 5 inches and a length of 12 inches was utilized; and a coil 13 having twelve turns was employed. 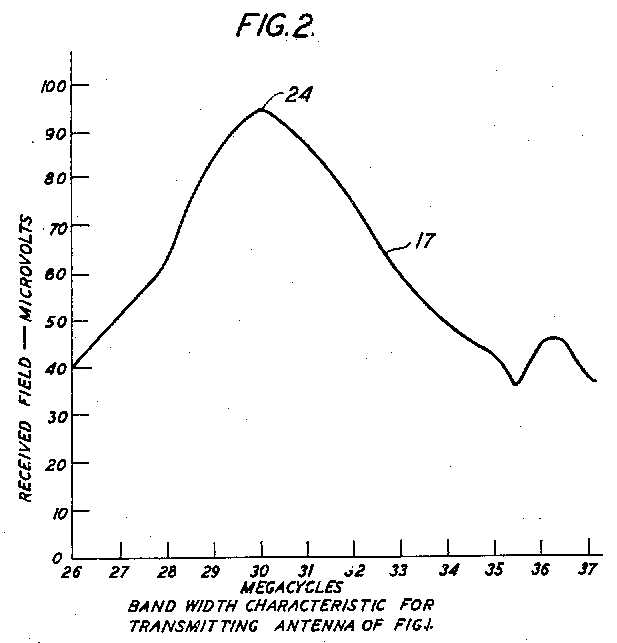 In a frequency test of the system, the frequency of the transmitter 4 was varied over the 26-37 megacycle range and the transmitted waves were received at a point spaced approximately 700 feet from the transmitting antenna 14. As shown by the curve 17, Pig. 2, which illustrates the measured band width characteristic of the system, maximum energy was received when the frequency was approximately 30 megacycles. For all frequencies in the band, the received energy was at least 40 microvolts. The curve 17 is fairly flat, relatively considered, so that the dipole has a fairly broad band width characteristic. The embodiment illustrated by Pig. 3 differs from the system of Fig. 1 in that a single turn tuned coil 18 is employed at point 11 of line I in place of the multiple turn coil 13. The coil 18 comprises a single turn 19 of line 2, a tubular member coaxially enclosing the coil 19 and an adjustable condenser 2 i connected in shunt with the tubular member 20. As in the system of Fig.1 waves are supplied by the transmitter over line 2 and coil 18 to the dipole 14 and thence radiated. The band width of the antenna of Pig. 3, while relatively broad, is somewhat more narrow than that of the system of Fig. 1 inasmuch as the single turn coil 18 and shunt condenser 21 function to produce sharper resonance. In a system constructed in accordance with Fig. 3, the lengths W and S of the whip 15 and skirt 16 were respectively 93.5 and 92 inches. The outside diameter of the tubular member 20 was 7/8 of an inch and the outside diameter of coil 18 was 10.25 inches. As shown by the band width curve 22, Fig. 4, the coil 18 produces maximum resonance at 30 megacycles. 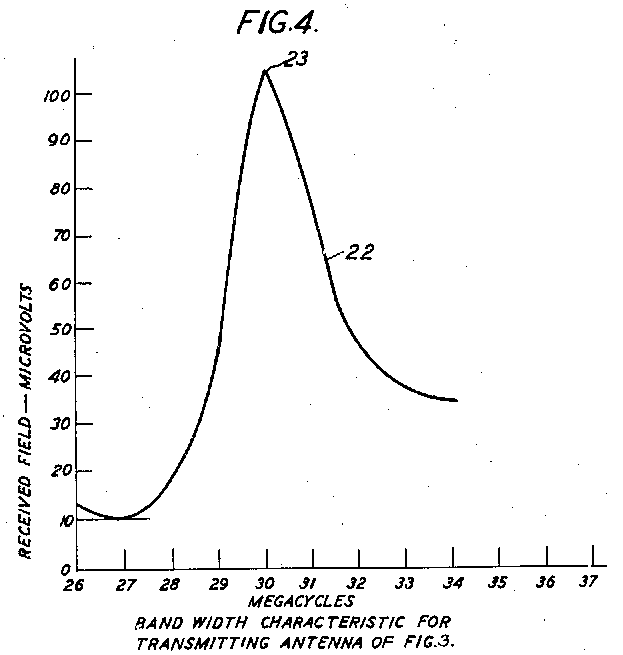 While the energies received at the frequencies in the central portion (29-32.5 megacycles) of the band were greater than 40 microvolts, the energies received at frequencies included in the two end portions of the band, 27-29 and 32.34 megacycles, were of small intensity, so that the system of Fig. 3 has, as compared to the system of Fig. 1, a narrow band width characteristic. At the mid-point of the band, however, the power transmitted by the dipole of Fig. 3 is greater than that transmitted by the dipole of Fig. 1, as shown by the fact that the peak or nose 23 of curve 22, Fig. 4, is above 100 microvolts and higher than the peak 24 of curve 17, Fig. 2, which is below 100 microvolts. Although the invention has been explained in connection with certain embodiments, it is to be understood that it is not limited to the embodiments described inasmuch as other apparatus may be employed in successfully practicing the invention. 1. A transmitting dipole antenna comprising a coaxial line having an inner conductor and an outer conductor, said inner conductor being longer than said outer conductor, means for resonating said dipole comprising an inductive coil including in said line at a point substantially a quarter wavelength from the extremity of the outer conductor and having approximately twelve turns. 2. In an antenna system, a transmitting dipole antenna comprising a coaxial line having an inner conductor and. an outer conductor, said inner conductor being substantially a quarter wavelength longer than the outer condcutor, said line being coiled at a point substantially a half wavelength from the extremity of the inner conductor, the coiled portion of said coaxial line forming an inductive coil having only a single turn, a tubular shield coaxially enclosing said coil and an' adjustable condenser connected in shunt with said shield. 3. In an antenna system, a coaxial line having an inner and an outer conductor, said inner conductor extending a given distance beyond the extremity of the outer conductor, said inner conductor being coiled at a point spaced from said extremity a distance substantially equal to said first-mentioned distance, the line section included between said point and the extremity of the inner conductor constituting a dipole having an effective electrical length one half of a given wavelength, the dipole and the coiled portion of said inner conductor being highly resonant over a broad band of wavelengths including said given wavelength. 4. In an antenna system, a vertical coaxial line having an inner conductor and an outer conductor, said inner conductor extending above the extremity of the outer conductor substantially a quarter wavelength as measured at a frequency included in a given band, means for substantially resonating over said band the exposed quarter wave portion of said inner conductor and the upper quarter wave end portion of said outer conductor comprising a coiled portion of the inner conductor located on said line substantially a quarter wavelength below said extremity, means for preventing the flow of undesired currents on the outer surface of the outer conductor portion comprising a coiled portion of the outer conductor coaxially enclosing said first mentioned coiled portion. Изобретение относится к антенной системы и, в частности гибкие передачи диполь антенных систем. Как известно, полуволнового диполя называется здесь "обычных диполей" и состоящий из двух го-линейные провода, и прочный вертикальный полуволновой "коаксиальный диполей" типа представлены в 2A"84 патентного 729 A, B . Бейли, занятых в области высоких частот и очень высокочастотных полей для передачи большого количества энергии. В общем, это довольно тяжелый передачи полуволнового диполя и связанные с ними линий электропередачи требуют жесткой несущей конструкции и, как правило, связаны, в дипольном средней точки, на несущей конструкции. Как правило, группа ширины этих техники жесткой передачи диполей относительно узкий и поэтому не вполне удовлетворительным. Соответственно, в настоящее время представляется целесообразным и выгодным для получения гибких высокая мощность передачи диполь с относительно широким бод характерной ширины. Это один объект данного изобретения для получения гибкой передачи дипольных антенн с широким ширину полосы. Еще одной целью настоящего изобретения является обеспечение портативной, легко поддерживается или приостановлено, iiigh власти диполь простой конструкции. Еще одной целью данного изобретения, чтобы обеспечить высокую мощность передачи диполь whiGh антенны не требует поддержки на средней точке. В соответствии с одним из вариантов изобретения высокую мощность передачи диполь включает в себя вертикальные коаксиальной линии с внутренним проводником расширения помимо внешнего проводника на расстоянии примерно 1/4 длины волны. На момент около четверти длины волны от конца внешнего проводника линии свернутый формировать сопротивление. Катушка функции резонировать полуволновой коаксиального створе выше катушки, то есть, чтобы обеспечить диполь действий, и, чтобы предотвратить поток ложных токов на внешней поверхности оставшейся части внешнего проводника под катушкой. Верхний конец внутреннего проводника прикрепляется через изолятор на опоре. Хотя антенну лучше всего подходит для передачи радиоволн может, конечно, быть использованы для радиоприема. рис. 3 вид сбоку различных вариантов осуществления изобретения, а на рис. 4 показано 5 характерной ширины полосы для воплощения рис. 3. Ссылаясь на рис. 1 цифрой I обозначает коаксиальной линии включающий внутренний проводник 2 и внешнего проводника 3. Линия 1 подключен на ближнем конце на 4 перевод устройства, например, очень высокая частота передатчика, а также часть линии рядом с удаленным концом вертикально. Внутренний проводник 2 расширяет сверх конечности 5 внешний проводник 3 Вт на расстоянии приблизительно равна четверти длины волны на частоте средств или дизайн работы. Конечность 6 внутреннего проводника 2 обеспечено через изолятор 7 и парень провод 8 опорным элементом 3, и внешнего проводника 3 поддерживается на конечности 5 на изоляторе 10 и внутреннего проводника 2. В пункте 11, расположенной на расстоянии примерно S 1/4 длины волны ниже конечности 5, линии я согнут или свернутый о трубчатый изолятор 12 так, чтобы сформировать несколько катушки сопротивления свою очередь, <3. Как объясняется ниже, в разделе 14 линии I, расположенное над точкой СО, включающего в себя воздействию внутренней части проводника или «кнут» (о и наружной части проводника или «юбки» 16 функций, как антенну в широком диапазоне частот. В операции, волны определенной частоты поставляются высокой мощности передатчика 4 на нижней части я линия и катушки от 13 до верхней части линии 14, а оттуда излучения. Катушка я 3 причины верхней части линии резонировать на рабочей частоте и, следовательно, функционировать как диполь. Как и в случае обычного вертикального диполя, директива картина существенно ненаправленная в горизонтальной плоскости и несколько направленности в вертикальной плоскости, направление максимального действия в вертикальной плоскости, являющийся горизонтальным .. Катушка 43, или, точнее, спиральный части внешнего проводника 3, функционирует как высокий импеданс которой поток ложных токов по внешней поверхности проводника центр 3 предотвратить. В системе на самом деле построен в соответствии с рис. 1, длины W и S кнута и юбка элементы 15 и 16 составила 90,5 и 82,5 дюймов соответственно. 12 трубчатых изолятор диаметром 5 дюймов и длиной 12 дюймов были использованы, и катушка 13, имеющий двенадцать поворотов работал. В частоте тест системы, частота передатчика 4 менялась в диапазоне 26-37 Мгц и прошедшей волн были получены в точке на расстоянии приблизительно 700 метров от передающей антенны 14. Как показано кривой 17, свинья. 2, который показывает измеренное характерная ширина полосы системы, максимальная энергия была получена, когда частота была примерно на 30 Мгц. Для всех частот в диапазоне, полученная энергия была не менее 40 микровольт. Кривая 17 является довольно плоский, относительно считается, таким образом, что диполь имеет достаточно широкий характерные ширина полосы. В варианте, показанном на рис. 3 отличается от схемы на рис. 1 в том, что один оборот катушки настроены 18 занятых в точке 11 линии я на месте нескольких катушку свою очередь, 13. Катушка 18 содержит одну свою очередь, 19 линия 2, трубчатый элемент соосно ограждающих катушки 19 и регулируемый конденсатора 2 я подключен шунт с трубчатый элемент 20. Как и в системе рис.1 волны снабжены передатчиком на линии 2 и катушки от 18 до 14 и диполь излучал оттуда. Ширина полосы антенны свиней. 3, в то время как относительно широкая, несколько более узкая, чем у системы на рис. 1, поскольку одна катушка свою очередь, 18 и шунтирующих конденсаторов 21 функций для создания острее резонанс. В системе, построенной в соответствии с рис. 3 длины W и S бича 15 и юбка 16 были соответственно 93,5 и 92 дюймов. Наружный диаметр трубчатый элемент 20 был 7/8 на дюйм и внешний диаметр рулона 18 была 10,25 дюйма. Как показывает кривая полоса шириной 22, рис. 4, катушка 18 создает максимальный резонанс на 30 Мгц. В то время как энергия, полученные на частотах в центральной части (29-32.5 Мгц) полосы было более 40 микровольт, энергии полученной на частотах, включенных в двух торцевых частей группы, 27-29 и 32,34 Мгц, были малой интенсивности, так что система Рис. 3 имеет, по сравнению с системой на рис. 1, узкий характерной ширины полосы. На середину группы, однако, власть передается дипольной рис. 3 больше, чем передается дипольной рис. 1, свидетельствует тот факт, что пик или нос кривой 23 22, рис. 4, выше 100 мкв и выше, чем пик кривой 24 17, рис. 2, которая меньше 100 микровольт. Хотя изобретение было описано в связи с некоторыми вариантами, то следует понимать, что она не ограничивается вариантами, описанными поскольку другие устройства могут быть использованы в практике успешно изобретения. 1. передачи дипольных антенн включает коаксиальной линии с внутренним проводником и внешним проводником, сказал внутренний проводник быть больше, чем сказал внешнего проводника, средства для резонирующих сказал диполь включающей катушки индуктивности в том числе в указанной линии в точке существенно четверти длины волны от оконечности внешнего проводника и имеющие примерно двенадцать поворотов. 2. В антенной системой, передающей дипольных антенн включает коаксиальной линии с внутренним проводником и. Внешний проводник, сказал внутренний проводник быть существенно четверти длины волны больше, чем внешние condcutor, сказал линии рулонной быть в точке существенно половину длины волны от оконечности внутреннего проводника, спиральный часть сказал коаксиальной линии формирования катушки индуктивности, имеющие только один ход, трубчатые щит соосно ограждающих сказал катушку и "регулируемый конденсатор подключен шунт с указанными щит. 3. В антенной системы, коаксиальной линии с внутренним и внешним проводником, сказал внутренний проводник расширения заданное расстояние за конечности внешнего проводника, сказал внутренний проводник быть рулонной в точке на расстоянии друг от сказал конечностей Расстояние практически равен заявил первом упомянутом расстоянии, линия раздела, заключенной между точкой и сказал оконечности внутреннего проводника, составляющих диполь с эффективной электрической длине половину данной длине волны, дипольных и рулонной часть указанного внутреннего проводника будучи очень резонансным в широком диапазоне длин волн, включая сказал данной длине волны. 4. В антенной системы, вертикальной коаксиальной линии с внутренним проводником и внешним проводником, сказал внутренний проводник расширения выше оконечности внешнего проводника существенно четверть длины волны, измеренная при частоте включен в данной зоне , средства для существенно более резонирующий сказал группы обнаженной части квартала волна сказал внутренним проводником и верхней четверти волны конце часть говорит внешнего проводника включает спиральный часть внутреннего проводника находится на указанной линии существенно четверти длины волны ниже сказал конечностей, средства для предотвращение потока нежелательных токов на внешней поверхности наружной части проводника включает спиральный части внешнего проводника соосно ограждающих сказал первое упоминание рулонной часть.